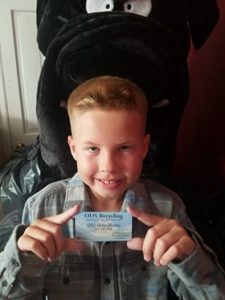 While most 9-year old’s are busy playing with friends or chasing a new high score on their favorite video game, Orion Shearer is out chasing bottles and cans. 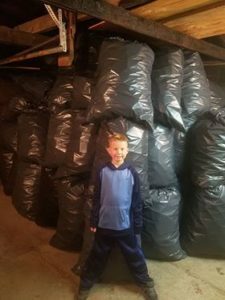 Orion’s dad reached out to Recycling Center Near Me via Facebook and we were blown away by some of the images showing how many bottles and cans the 9-year-old had collected. We had a chance to speak to his parents and what we found out about this young entrepreneur was astonishing and exciting. It turns out what initially started out as a habit to pick up cans for extra Christmas money quickly turned into something much bigger. Since March of this year, over 22,000 aluminum cans have been collected and approximately 19,000 plastic bottles and a company named ODS Recycling has been launched. The plan is to put 80% of the money in a savings account for college with the remaining 20% going to other causes. Orion was initially motivated by another young boy in California named Ryan Hickman who started recycling at a young age and wants to keep plastic out of the ocean in order to save the sea lions. Orion who has a love for sea turtles decided he would follow in his footsteps because of his love for sea turtles and plans to donate a portion of the recycling profits to Mystic Aquarium. When starting out word quickly got around town about the boy who recycles. Now Orion has a network of 78 different contacts including golf courses who collect bottles and cans and donate to ODS Recycling. 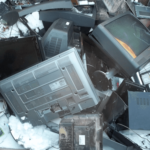 In the state of Massachusetts cash redemption is only given for aluminum cans, but not plastic bottles so many people throw these items away rather than recycle. This created a great opportunity for ODS Recycling because they are able to collect these bottles and take them to Connecticut where plastic bottles can still be recycled for cash. Orion, who is just starting 5th grade has already been featured in the local channel 22 news and also the local newspaper. During the summer when not in school he would collect cans and bottles all day, sometimes staying out until midnight with his dad collecting cans. Now that school has started he still puts in around 2 – 2.5 hours per day collecting. His parents have put an emphasis on school first, but once homework is done Orion is out collecting cans and bottles. Storing all these bottles and cans has not been an easy task. An extra bedroom in their house has been overtaken with 35 55-gallon trash bags that are full of bottles and cans. Orion’s dad said even his mother’s 2 garage is now storing cans. In addition to helping the environment, Orion will also be donating to the Springfield Shriners Hospitals for Children through their Pull Tab Collection Program. The pull tab is pure aluminum and even after the tab is removed the cans still retain their original redemption value. 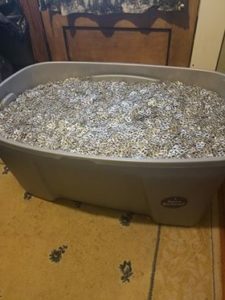 Orion’s dad estimates he currently has 1600 pounds of pull tabs and Shriners gets 70 cents per pound for the pull tabs which is worth a little over $1100. 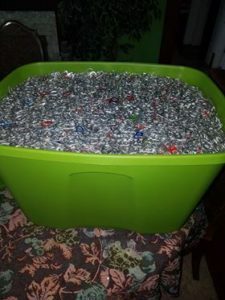 Getting the pull tabs off 22,000 cans requires a lot of man hours so an event has been organized through the ODS Facebook page. On September 23, hot dogs and hamburgers and drinks will be served while volunteers assist in removing the pull tabs that will be donated to Shriners. The donation is expected to be the largest the Springfield, Mass. Shriners has ever seen. When asked about future plans for ODS Recycling, Orion’s mom said he has no intention of slowing down and will continue to work on expanding the business. 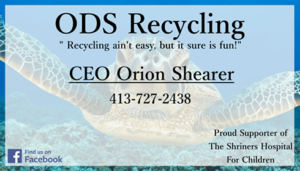 ODS Recycling already has business cards and a banner, with plans to expand to T-Shirts and pens in the works. Hi i am one of Orions mom’s friends. We were roomates about a year ago. So i had the pleasure of getting to know Orion. He is definitely not like other kids his age. He is a very smart boy and has one of the BIGGEST hearts ive ever seen in a 9 year old! I cannot express how proud i am of him! I have no doubt that he will succeed in his business, helping to save children and sea turtles! I Will be so glad to help on September 23! Orion, hun i love you! i am super proud if you Kiddo!